Harrow United Church was blessed with the gift of music when Elation Pauls and her family visited. 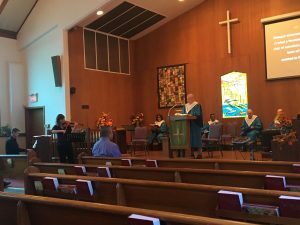 Elation suggested two of the scripture readings as well as playing her violin so beautifully and accompanying the choir on several hymns. Clara accompanied her mom Elation. 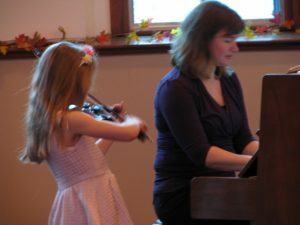 We were also treated to a a performance by her daughter Clara on violin while her mom accompanied her on piano. This is obviously a talented family. We’re grateful to have you share your talents with us. Elation Pauls serves as assistant principal second violin in the WSO and Co-Artistic Director of the Rosamunde Summer Music Academy. Originally from Saskatoon, she holds the coveted Solo Performance degree from the Hochschule für Musik und Theater in Rostock, Germany, having earlier completed her Bachelor and Master of Music degrees at the University of Toronto where she studied with Lorand Fenyves, Mark Fewer, and Erika Raum. 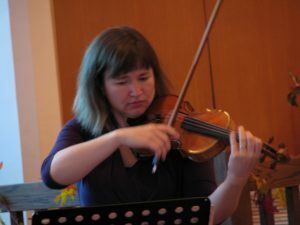 As well as playing in the Kammerphilharmonie Berlin-Brandenburg, Windsor Symphony Orchestra, Hamilton Philharmonic, and the Hamburger Symphoniker directed by Andrey Boreyko and Jeffrey Tate, she has performed as a soloist with the Neinstedt Chamber Players (Germany), Spiritosi Strings, Banff Festival Chamber Orchestra, and the Mooredale Concerto Players in Toronto. An avid chamber musician, her performances in this capacity have taken her from Toronto to Berlin, as well as the Schleswig-Holstein, Banff, Domaine Forget, and Kent/Blossom music festivals.